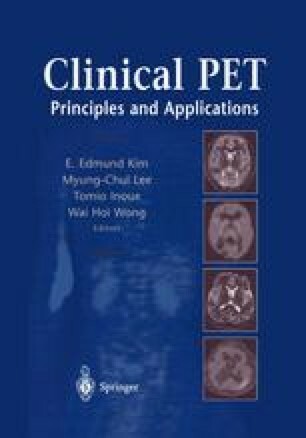 Positron emission tomography (PET) is a unique imaging modality with the capability of studying regional metabolism. 18F-fluorodeoxyglucose (FDG) is the most widely used tracer in the field of PET oncology. The clinical utility of oncology PET using FDG has been proven in the staging and restaging of malignant tumors such as head/neck, lung, breast, and colorectal cancers, as well as malignant lymphoma, and melanoma. In the field of urology, FDG-PET has been evaluated in the relevant malignancies with promising results in certain areas and disappointing results in others. At this stage FDG-PET is capable of visualizing urologic tumors and associated lymph nodes and distal metastatic sites. However, its use is severely limited by the excretion of the most commonly used radioisotope via the urinary tract, making pelvic imaging particularly unrewarding. 11C-choline upregulated in malignant cells has shown potential usefulness in brain, prostate, and esophageal cancers with enhanced synthesis of membrane phospholipids. This chapter discusses the clinical usefulness of oncology PET in the field of urology including renal cell, urinary bladder, and prostate cancer, as well as testicular tumors. We review the related articles of PET oncology in the field of urology.